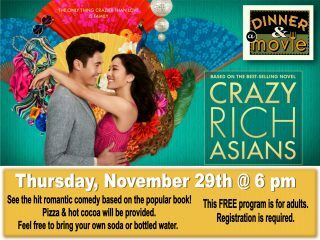 See the hit romantic comedy, Crazy Rich Asians, based on the popular book! Pizza and hot cocoa will be provided. Feel free to bring your own bottled water or soda. Registration required. This FREE program is for adults. To register call or stop by the Central Library.